Bajaj has launched the updated 2019 Dominar 400 in the Indian market. The new Bajaj Dominar 400 (2019) is priced at Rs 1.73 lakh, ex-showroom (Delhi). This is roughly Rs 10,000 more than the previous generation model. The new Bajaj Dominar 400 (2019) comes with a number of updates and additional features. This includes a number of cosmetic and mechanical changes made to the 2019 Dominar 400 model. Updates on the new Dominar 400 include refreshed styling with an updated body graphics. The new Bajaj Dominar 400 now comes with updated hardware as well including refreshed LED headlamps and LED tail lights with updated internals. The 2019 Dominar also comes with an updated fully-digital instrument cluster and a new screen on the fuel tank which display additional information such as gear indicator, odometer and a clock. The new Bajaj Dominar 400 also comes with a completely new suspension setup. The new Dominar 400 comes with upside-down front forks, replacing the conventional telescopic setup on the previous model. The rear suspension continues to carry forward the same monoshock set up. The brakes on the new Bajaj Dominar 400 also remain unchanged. It continues to feature a single 320mm and 230mm disc at the front and rear, respectively. Both of which are supported by a dual-channel ABS system as standard. The alloy wheels on the Dominar 400 have also been updated to a dual-tone finish; replacing the gold-coloured wheels. 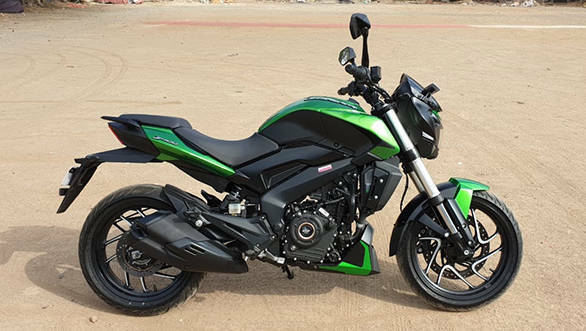 Bajaj has also updated the exhaust on the new Dominar 400 as well. However, one of the main updates on the new Bajaj Dominar 400 is the engine. The Bajaj Dominar 400 is the flagship model from the Indian bike manufacturer in the market. The new Bajaj Dominar 400 now comes with a host of updates and features over the previous model. The new Bajaj Dominar 400 continues to rival the likes of the TVS Apache RR310, KTM 390 Duke, Honda CB300R and the BMW G 310 R in the Indian market.